NEW DELHI: Seeking justice for ex-servicemen, BJP leader Subramanian Swamy today met Defence Minister Manohar Parrikar and raised the issue of one-rank one-pension. He reminded Parrikar that the implementation of same-rank same-pension scheme was BJP's 2014 election promise made by Prime Minister Narendra Modi during the campaigning at Bhiwani. In his speech at Bhiwani, Modi had stated that if BJP came to power after the Lok Sabha elections, the BJP government would do justice to the ex-servicemen of the armed forces on the same rank-same pension issue. One-rank, one-pension means soldiers of the same rank and the same length of service get the same pension, irrespective of their retirement date. For an example, a sepoy who retired in 1995 would get the same amount of pension as the one who retired in 1996. According to Swamy, Parrikar told him that he is seized of the matter and is closely studying the issue with a view to finding a solution to the satisfaction of ex-servicemen. The Defence Minister assured Swamy that an announcement on the issue of one-rank one-pension is expected to be made by the time of the Budget presentation in February next year. The decision to implement the scheme was first announced by former Finance Minister P Chidambaram in the UPA government's interim Budget in February this year. Chidambaram had allocated Rs 500 crore for it. The NDA government had allocated Rs 1000 crore for the scheme in its July Budget this year. Besides one-rank one-pension scheme, Swamy also brought to Parrikar's notice some strategic issues regarding China's defence capacity. Subject: Change in date of birth/age of family pensioners for payment of additional pension. You see me on TV how I have been analysing defence matters and taking-on Pakistani panelists, now you can read my views in print. I have teamed up with a media company to bring India's first popular format magazine, FAUJI INDIA for the armed forces in independent media space. It has been six months that this magazine is in circulation and already making sensation in the country. You will love to read this magazine in understanding how we can journey to become a superpower. It is available only through annual subscription at present. Please send your address in email to get a trial copy and catch up with forthcoming January issue. Do check the blog link below in your own time at leisure. Let's work together to make India a superpower. 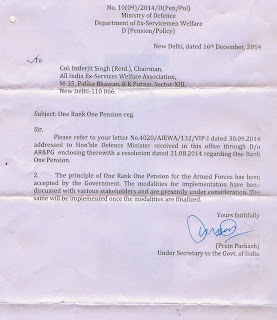 Upset by the statements of the leadership about our one single most important demand of ONE RANK ONE PENSION (OROP) our Association passed a Resolution in our Governing Council Meeting on 21 Aug 2014 and as per the directions of the members it was despatched to the Hon'ble PM with a copy to the Hon'ble RM. A Copy of the Resolution follows this mail. "It basically wanted the OROP demand should be met by 31 Dec 2014 failing which we shall presume that our respected PM was not satisfied by the sacrifices we have already made for the Nation and he wants more from us. We shall then make more so that he can be won over." "The principle of One Rank One Pension for the Armed Forces has been accepted by the Government. The modalities for implementation have been discussed with various stakeholders and are presently under consideration. The same will be implemented once the modalities are finalised." The Defence Minister Shri Manohar Parrikar has directed MoD officials to evolve a policy for reducing court cases in service matters including pensions. In a message on the occasion of the Good Governance Day today, he said, minimization of litigation is a priority and that issues of cantonments pertaining to land management and civilian interface should also be resolved without delay. Ministry of Defence has adopted a number of Good Governance initiatives like promoting e-Governance, e-Procurement, Biometric Attendance, Jeevan Pramaan, Digitization of records, online disposal of Public Grievances and use of online monitoring of the status of Court/Tribunal/NHRC cases. An Intra-MoD Portal has been developed for supporting these applications in the Ministry. Directorate General of Defence Estates have made good progress in digitization of Defence Land records. History division of the Ministry has also digitized War Records. Several other digitized records viz. Recruitment Rules, civil lists etc are likely to be placed on our website very soon. This Ministry is committed to early implementation of One Rank One Pension for the Armed Forces and measures are being taken for the same. Minimization of litigation is a priority and I have instructed the concerned officers to evolve a policy for reducing court cases in service matters including pensions as well as in issues of cantonments pertaining to land management and civilian interface. The Public Grievances are being forwarded to the concerned officers using online methods. In this context, I have directed all concerned to accord utmost importance to time- bound disposal of Public Grievances in the Ministry as also regular monitoring of the pendency of Public Grievances by senior officers. 1. Naval Pension Office (NAVPEN) has been operationalised at Mankhurd, Mumbai to act as single window organisation to handle retirement activities of all Naval Personnel. NAVPEN had commenced activities related to sailor's pension wef 01 Feb 2014 and officers' pension wef 01 Apr 2014 to facilitate speedy settlement of pensionary claims. 2. It has therefore, been decided that in line with the mandate given to NAVPEN to act as single window for redressal of queries/ grievance of all retired personnel, the functioning of 'Samadhan Cell' will shift from IHQ MoD (Navy)/DPA to NAVPEN with immediate effect. The existing Help Desk at NAVPEN will henceforth be called as the "Samadhan Cell". Figure 81 denotes the year of our raising. IESM is grateful to you for granting us time on 09 Dec 2014 to discuss One Rank One Pension (OROP) with one of the stake holders, in spite of your busy schedule when Parliament is in session. You patiently heard our point of view on this issue which has been agitating Armed Forces Veterans since 1982. You showed your sincerity to view this issue from different angles which unfortunately landed in your lap. The definition of OROP has been succinctly brought out by the written answer given in hon’ble parliament by Shri Rao Inderjit Singh, Raksha Rajya Mantri on 02 Dec 2014. We felt now that there is no doubt in definition of OROP even in Central Government. So we felt your meeting is only to chalk out a road map for implementation of OROP. Since the definition is very simple to understand in that pre – 2014 pensioner of same rank with same length of service will get same pension as if he retired on 31 Mar 2014 and his pension is hiked on 01 Jul 2015, we were happy that Government letter for implementation may not take much time to be issued. We even offered services of knowledgeable Armed Forces veterans to help out CGDA in making tables for various ranks indicating pensions rank wise and length of service wise and arrive at arrears w.e.f. 01 Apr 2014. Your reply to query posed by Col Vinay Thapar in The Headlines Today conclave that 100% satisfaction is not possible in real life has caused much consternation in the minds of veterans. We are getting anxious calls from veterans not only from India but also from those settled abroad on meaning of 80 to 95% of OROP. Sir, the Govt of India is already violating hon’ble Supreme Court judgment delivered in Maj Gen SPS Vains Vs Union of India where the apex court has made unambiguous judgment that senior ranked veteran cannot get pension less than a his junior. Today a Maj Gen retired in 2005 gets lesser pension than a Brigadier retired in Nov 2014. 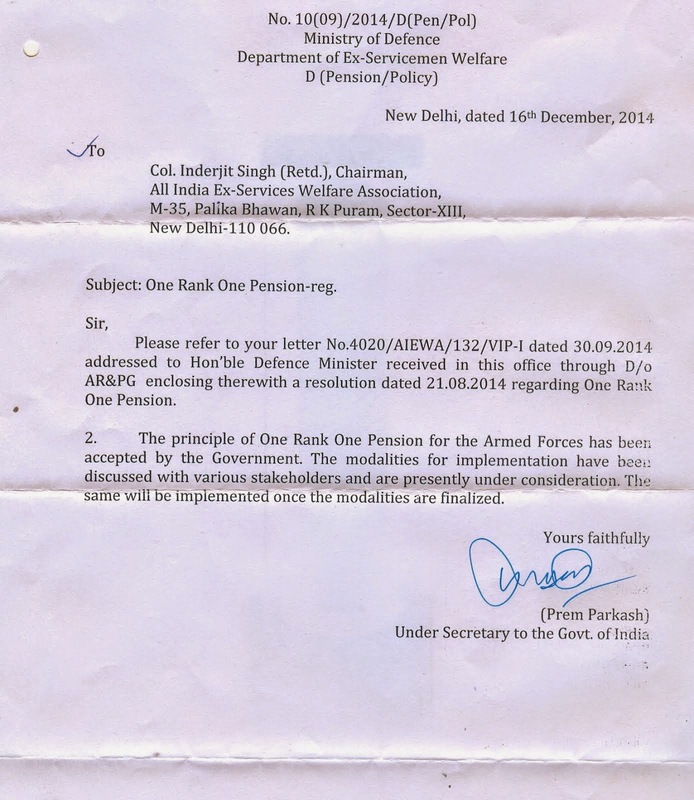 The OROP stands sanctioned by the Govt. It has to be implemented 100 percent as per the approved definition and the executive orders issued by the Govt. Also there has been an assurance by the PM, RM on a number of occasions that actual OROP will be implemented. Any dilution to the approved definition will not be OROP. May we, therefore request you to accept the DGL prepared by the Service HQs without any dilution and issue instructions for the implementation of OROP as assured by you within 30 days ie by 09 Jan 2015. Sir, there is extreme pressure from the Ex Servicemen to start a countrywide agitation to get Justice. They are getting restless since 10 months have passed when OROP was sanctioned on 17 Feb 2014, but its implementation has not been done till date. We had held in- abeyance our planned agitation from 03 to 16 Dec 2014 after getting positive feedback that the Govt is likely to implement OROP soon. Sir, We have not understood why CGDA cannot consult Armed Forces Veterans on OROP like Ministry of Pensions, Personnel and Public Grievance does whenever any letter is issued affecting pensioners does. It appears, sir, you as Rakshma Mantri is very clear on OROP but it is the IDAS Officers in Min of Def who are found to be stumbling block trying to find out difficulties in arriving at Govt letter on implementation where there are no difficulties at all. Your discussion with Dr Subrahmanyam Swamy of BJP on 21 Dec 2014 where in you are reported to have said implementation after taking concerns of Ex-Servicemen is likely to be effected by budget session in Feb 2015 has left us wondering as to where is the delay now? If funds are the problem as you expressed to IESL delegation which met you on 10 Dec 2014, IESM has suggested mode of payment of arrears to widows first, PBOR second and Officers last. May we request you to expedite issue of Govt Notification for the implementation of OROP as per the approved definition and as per the DGL prepared by the Service HQs. There are more than one crore pensioners in the country including pensioners from Central Govt and Defense personnel. This figure does not include pensioners drawing their pension from state and UT Govts, PSUs, Municipal Corporations, Councils and other local bodies. As informed earlier, in order to curtail the hardship caused to pensioners, the Government of India had launched “Jeevan Pramaan”, a digital life certificate based on Aadhaar Biometric Authentication, aimed at further simplifying the process of submission of life certificate and facilitating accuracy and timeliness in disbursal of pensions. A web portal jeevanpramaan.gov.in was launched by the Hon’ble Prime Minister on November 10, 2014. Now RBI has given instructions to Banks vide RBI/2014-15/343 DGBA.GAD.H- 2529/45.01.001/2014-15 dated 9th Dec '14,on implementation of the same as follows. “They are in the line of fire. They sacrifice their life for you and for us. This is the least you could do for them.” It was the message by the Supreme Court to the Centre, which was fighting against the ex-servicemen of Army over a modest increase in their disability pension. Coming to the rescue of around 15,000 soldiers, the court rejected an appeal by the government against an order of the Armed Forces Tribunal (AFT), which had extended the benefits of an extra amount in their pensions on account of disability due to service conditions. On Wednesday, a bench led by Chief Justice of India H L Dattu expressed its disgruntlement over the government’s insistence on denying the benefit to the soldiers on the ground that it would burden the exchequer with an additional Rs. 1500 crore. “So what? The Government can have at least this much of budget for its soldiers who are dying for the people of this country everyday. What is the point of having these memorials and placards saluting our defence personnel if you litigate against the disabled soldiers till the Supreme Court. You should pay them,” said the bench, also comprising Justices Madan B Lokur and A K Sikri. With the writing on the wall, the government’s law officer chose not to argue the appeal further and said they would comply with the order. The bench disposed of around 880 appeals against the AFT order on this issue. Among those who will be benefited by this order is also Army’s former Vice-Chief Lt Gen Vijay Oberoi, who lost his leg in a gun battle in the 1965 Indo-Pakistan war. Oberoi soldiered on without any financial benefit whilst in service but was categorised as 70 per cent disabled when he retired as the army’s vice chief in 2001. When the 5th Pay Commission enhanced this to 75 per cent, the Ministry of Defence (MoD) refused to pay. On Oberoi’s petition, the Chandigarh bench of the AFT, in 2010 allowed “broad-banding” benefits to all disabled personnel irrespective of when they left service. Under the “broad-banding” policy, three bands were to judge disability across the board. Up to 50 per cent disability, a person was to be given the benefits of a 50 percent disability holder; a person with 51-75 per cent disability was to be given 75 per cent disability benefits; while a person with 76-100 per cent disability was to be given 100 per cent disability benefits. The policy was introduced to avoid subjectivity and variance in calculating disability percentage. This broad-banding was accepted and implemented by the MoD but the benefits were granted to only those who were removed from service by the government on medical grounds, and not to those who retired after their full service. The AFT removed this anomaly and held that all the soldiers shall get the benefit under the policy. The Department of Ex-Servicemen Welfare (DESW), which comes under the MoD and looks into the grievances and other pension matters of retired defence personnel, filed an appeal against the AFT judgement in February 2012 despite an adverse opinion by the Army Headquarters. Roman emperor Augustus started the tradition of military pensions in 13 BC, when every legionary who had fought 20 years for Rome was guaranteed a pension for-life. It set the bar for modern armies, and independent India continued the British tradition of financially privileging military service until the mid-1970s, when soldiers were paid more than civilian bureaucrats, in service and after retirement. All that changed with the Third Pay Commission, which brought military salaries in line with civil services, and while soldiers have long complained about political control over the military in independent India mutating into bureaucratic control, a row over the NDA's promise for one-rank-one-pension (OROP) for military veterans is raising questions about the government's ability to translate its intent into action. Fifteen months after Narendra Modi first demanded it immediately after being anointed the BJP's PM candidate, 10 months after the UPA government granted it, five months after NDA's finance minister Arun Jaitley confirmed it and almost two months after the PM told soldiers in Siachen that it was his "destiny that one rank-one pension has been fulfilled", military veterans are questioning why the promise has still not been implemented. Put simply, OROP means that every pension-eligible soldier who retires in a particular rank deserves the same pension, irrespective of date of retirement. Currently, soldiers who left the armed forces more recently receive more than those who did earlier, because successive pay commissions hiked salaries. Two days after he was anointed BJP's PM-candidate in September 2013, Modi vehemently supported the OROP demand at a veterans' rally in Rewari. With roughly 12 lakh veterans also constituting a huge vote-bank, UPA government approved the demand in February 2014, and it was reaffirmed by NDA in July, when finance minister Arun Jaitley specifically provisioned Rs 1,000 crore in his 2014-15 budget (within an overall defence pensions budget of Rs 51,000 crore). Yet, it remains stuck in bureaucratic wrangling. At the heart of the problem are bureaucratic disagreements over costs. The finance ministry told a parliamentary committee in 2011 that it would cost Rs 1,300 crore a year while defence ministry pegged annual cost estimates at Rs 3,000 crore. Yet, now that OROP has been approved, the Comptroller of Defence Accounts has reportedly put the bill as high as Rs 9,300 crore per annum (see charts). Defence minister Manohar Parikkar has held stakeholder meetings to resolve the crisis, most recently on December 10, with no clear solution yet. Veterans' groups are perplexed at the changing goalposts, blaming the bureaucracy for being obscurantist. Says Lt Gen SK Bahri (retd), chairman, Alliance of Ex-Servicemen Organisations: "The bureaucracy is fighting a rear-guard action. It is not difficult to find funds but our problem is the lower bureaucracy which can stop anything in the ministry . We are fighting an internal enemy." Veteran groups, fighting the OROP battle for at least two decades, claim they don't have the ears of the leadership. "Whatever the bureaucracy tells them, they believe," says Lt Col Inderjit Singh, chairman, All-India Ex-Services Welfare Organisation. Reassuring doubters, Parrikar was recently quoted as saying that "the government is seriously considering implementing the one-rank-one-pension policy" and the "announcement will be made in four to eight weeks". His words may reassure veteran groups who have been organizing protest rallies. Their social media networks are full of invective and a growing sense of "betrayal" and "disillusionment", which is fast gaining a political edge. The fight for OROP, in this narrative, is turning into a new cipher for the ever-present military trope of overbearing bureaucrats being allowed to ride rough-shod over them in a Defence Ministry that is still not integrated with Service Headquarters, as in other liberal democracies. The problem is that different departments used different formulas to calculate costs but as Major Navdeep Singh, advocate in Punjab and Haryana High Court points out, "the directive to break this logjam has to come from the top". "There seems to be an anti-services sentiment in the lower bureaucracy," he adds, "but higher echelons must overrule such disputes." The case for OROP is predicated on military terms of service being much harsher than those for civil services. Most soldiers retire between 35-37 years of age, while officers below brigadier-or-equivalent do so at 54, with limited re-employment options. Civil servants, in contrast, retire at 60. Moreover, the Sixth Pay Commission granted the facility of what bureaucrats call "non-functional upgrade" (NFU) to officers in all-India Group A services.This is a sort of `pay-promotion', allowing them, under certain conditions, to draw higher pay than their rank, without actually being promoted. Almost all civil servants benefit from this while defence services officers do not, even as their career pyramid is much steeper.Only 0.8% of defence officers make it to the rank of major general after 28 years of service, compared with a much higher rate of civil servants who are eligible to become joint secretaries at 19 years of service. As Major Navdeep Singh says, veterans see NFU as a sort of "OROP by backdoor for civil servants". Many distinguished veterans argue that they are only asking for what was promised to them, pointing to the aphorism of Chankaya, the architect of the Mauryan empire, who is said to have advised his prodigy Chandragupta Maurya thus: "The day a soldier has to demand his dues will be a sad day for Magadha.From then on you have lost all moral sanctions to be King."